Modeling and simulation (M&S) helps solve critical challenges in government, industry, and academia. MITRE experts recently contributed to three new books that illuminate the promise of M and S as a profession, in research, and in the field. What do weather forecasting, aircraft design, and medicine development have in common? For one thing, they all benefit from a technique called modeling and simulation (M&S) to improve performance and accelerate discovery. Within MITRE, our staff can call on the resources of MITRE’s Modeling, Simulation, Experimentation, and Analytics (MSEA) Technical Center. The MSEA supports a wide range of work carried out in our federally funded research and development centers. It's part of our public-interest mission to share technical knowledge. That's why MITRE staff recently served as chief editors and contributors for three new books on various aspects of M&S, collaborating with academic and government colleagues. Here, the authors—each of whom works within the MSEA and holds computer science or computer engineering doctorates—offer their take on the importance of modeling and simulation. M&S relies on sophisticated computer software to replicate how things might work by allowing researchers to add and subtract variables that could produce different outcomes. As computational power grows, the ability to make better and more detailed models grows with it. Researchers apply M&S technologies to explore the many complexities of a system or enterprise before it's built—demonstrating options, identifying potential issues, and testing solutions. Used correctly, this virtual form of experimentation saves time and money. It can power innovative thinking as well, since people can test more of their "out there" ideas before taking them into the field. The discipline is now vital to virtually all technical, scientific, and even artistic fields. For example, architects can determine if the use of a specific composite material might affect the structure of a new building—long before construction begins. Are You a Modeling and Simulation Natural? M&S as a career is the topic of the first book, The Profession of Modeling and Simulation: Discipline, Ethics, Education, Vocation, Societies, and Economics. Published by John Wiley & Sons, Inc., this first-of-its-kind work brings together contributions from nearly three dozen experts at the leading edge of M&S. The authors chronicle the evolution of the field, sharing insights on issues fundamental to professional success and career development. Andreas Tolk, a member of the MSEA and recently designated Fellow of the Society for Modeling and Simulation, served as editor. "The community of modeling and simulation has been working for years on codifying the skills and expertise the profession needs," he says. "Our book recommends an index to this knowledge and embeds it into a broader context of ethics, societies, and the economics of modeling and simulation. Such a body of knowledge is the glue that binds together common concepts, relations, and methods that all professionals understand and share." Traditionally, M&S was not its own discipline, but a practice that supports other disciplines, Tolk explains. But that's starting to change. "Over time, researchers have discovered common concepts and methods for M&S and have developed academic curricula to teach these methods. We now look forward to having many more generalists in the field. We want people who can stand above individual application to see the big picture." Tolk believes the book will be especially helpful to this next generation, many of whom may be thinking about how to apply their mathematics, engineering, or computer science skills to their careers. The second book, Research Challenges in Modeling and Simulation for Engineering Complex Systems, published by Springer International Publishing AG, delves deeply into the future of M&S research and its role in engineering complex systems. It also provides a useful framework for future research funding. "The book grew out of a 2016 workshop sponsored by the National Science Foundation," says Ernest Page, a MITRE chief engineer of technology who served on the book's editorial team. He worked with representatives from Georgia Tech, the National Institute of Standards and Technology, Northwestern University, and Purdue University. "We examine research challenges in four key areas," Page explains. "Can we design effective conceptual models of complex systems? Can we increase the efficiency and scalability of our computational approaches? Can we develop better methods for identifying and managing underlying uncertainty in complex system models? And finally, can we improve the way we reuse models and simulations?" Reusing and repurposing models shows particular promise, he says. Along with the potential cost and labor savings, reuse offers the opportunity for simulations in different parts of the world to run cooperatively—a feature known as interoperability. "For example, a pilot in a flight simulator at Wright-Patterson Air Force Base in Dayton, Ohio, needs to be engaged in a training simulation with a tank simulator crew in Fort Benning, Georgia. The Department of Defense applies this form of reuse widely—it's very valuable across the defense simulation enterprise." The third work, Guide to Simulation-based Disciplines: Advancing our Computational Future, is also published by Springer. It looks at the many disciplines M&S significantly shapes and highlights the benefits simulation can bring to any field. The book presents case studies from such diverse domains as engineering, life sciences, social sciences, architecture, and the arts. 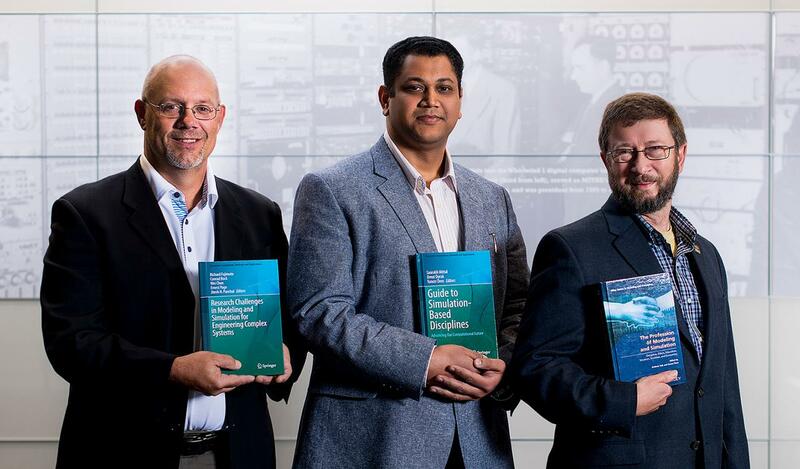 Saurabh Mittal, a lead systems engineering scientist, served as main editor for this compendium, to which several international experts contributed. He compares the use of M&S with the creation of a work of art. "The first step is to be aware of the tools at hand, including various modeling software and mathematical approaches. The second is to consider the size of your canvas, from the scope of the solution to available funding and project constraints. The third is to use these tools elegantly so that the resulting picture, the model, conveys an understanding of reality." Together, the three books underscore the growing importance of M&S in designing increasingly complex systems. "M&S is indispensable to how we get things done across virtually every aspect of modern life," Tolk says. "It will continue to help us identify, understand, manage, and engineer behavior patterns that can't be captured by any other means." Learn more: This year marks the 50th Anniversary of the Winter Simulation Conference, which features leadership from MITRE's Ernie Page as general chair, John Tufarolo as business chair, and Saurabh Mittal as one of the track chairs.